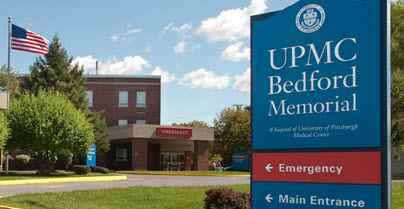 Bedford County residents are fortunate to have the broad array of health care services provided by UPMC Bedford Memorial, Hyndman Area Health Center and the many excellent retirement and primary-care facilities. UPMC Bedford Memorial is the area’s primary acute care general hospital. As part of UPMC, area residents have access to a wide range of traveling specialists in addition to the fine local medical staff. UPMC Bedford Memorial offers units for medical, surgical, obstetrical, intensive care, coronary care, and telemetry services, and has a variety of diagnostic capabilities, including CT scan, MRI and ultrasound. Emergency services include an emergency room with 24 hour in-house emergency medicine physicians, a licensed heliport for emergency transportation, and trauma center affiliation. Other onsite services include a cardiac-pulmonary rehabilitation program, an outpatient procedure unit, and an ambulatory surgical unit. Consistently recognized as an excellent facility, UPMC Bedford Memorial has been awarded the prestigious 100 Top Hospitals National Benchmarks for Success Award several times. UPMC Bedford Memorial has undergone major renovations. Construction first started in 2008 and is now complete in many areas. From the front entrance and waiting room to the nursing units and Emergency Department, new cabinetry, floors, lights, and painting have created a very comfortable and welcoming appearance. The Emergency Department, shown above, highlights the many changes. Another component of the $5 million investment was switching the facility’s boilers from coal to oil, which will benefit the environment and the bottom line. Efforts are ongoing to renovate all of the patient rooms at the hospital. Six rooms have been completed to date, with five more currently under construction. Serving the medical and dental needs of southern Bedford County and beyond, Hyndman Area Health Center now has a second location in Bedford. The Health Center is Bedford County’s only federally qualified health center. That status helps to provide the Health Center with a grant to help provide care to people without insurance. For Medicare patients receiving treatment, it means their deductible will be waived. The fee-discount program, which is needs-accessed, allows access to medical services and prescription drugs for many who might otherwise not afford them. County residents have many excellent options if their health requirements make living on their own no longer practical. Pennknoll Village, located near the hospital, is a rehabilitation and skilled nursing care facility with 133 beds. Accepting both short- and long-term care patients, Pennknoll Village offers a wide range of rehabilitation and therapeutic services including physical, occupational and speech therapy, IV therapy, and hospice services to make the patient’s stay as comfortable and beneficial as possible. Next door to Pennknoll Village, Homewood at Spring House Estates is expanding. Construction of 142 new homes and apartments has started and will continue for the next several years.